8 flour or corn tortillas (I will say that corn is more "authentic" but it's also more time consuming. So flour will work if you're in hurry and feel like making less of a mess). Add the chopped onion to a pan with the olive oil. Saute until transparent. Then add the beef until browned, the green chiles and warm through, adding garlic salt and cumin to taste. I added about a 1/2 tablespoon of cumin and 1 teaspoon of garlic salt, but whatever suits your taste will be lovely. If you had some fresh cilantro to throw into the warmed beef mixture that'd be super awesome too! Once warmed through, spread the mixture evenly over your 8 tortillas* and top with shredded cheese. Tuck them together in a casserole dish (seam side down) and start the sauce. While you do that, it's best to pre-heat the oven to 350. Now it's on to making the yummy sour cream sauce. Usually sour cream sauce is for chicken enchiladas, but it's so good, I figured that beef should get some love too, you know? Add your butter and flour to the same pan in which you warmed the beef mixture. Let's face it. There's always good flavor left over from something like that, and I figure why waste it. I use a cast iron skillet for these sort of endeavors, so you get added flavor from the pan. You'll want to make a basic roux by whisking the butter and flour together for a few minutes until it turns a golden brown. Then add in your sour cream, milk (or half and half), and your bullion cubes- dissolved in 1c water, and bring to a boil, cooking until smooth. Add your salt (as needed) pepper and cumin. When the sauce is seasoned to your taste, pour it over the enchiladas and top each with two tablespoons of green salsa and shredded cheese. Bake it in the oven for about 15 minutes (or until the cheese is melted and the sauce is bubbly). 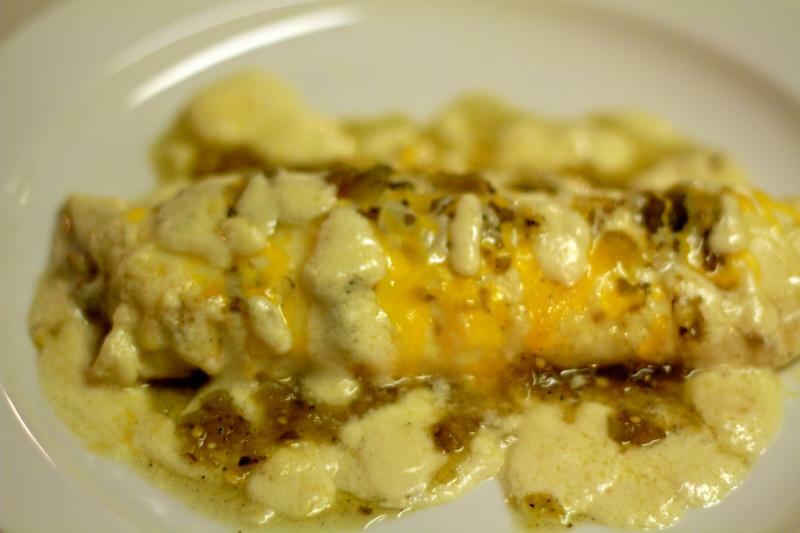 To serve, I like to add another spoonful of salsa verde to the top of each enchilada. These are so yummy with Mexican rice and refried beans! And don't forget your 'rita! *If using corn tortillas, you'll want to run each tortilla through some warm oil, to make them soft and pliable. About 4 tablespoons in a sauce pan should do the trick. Leave it in for a minute or so over medium heat, turning once so both sides have been dredged. Place on a paper towel to drain and then use!